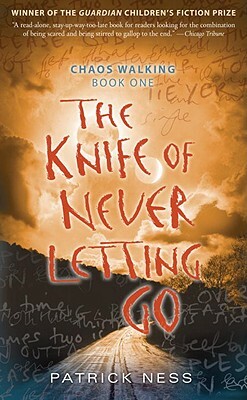 Lionsgate has selected Charlie Kaufman to adapt the first book in Patrick Ness' Chaos Walking trilogy for film. Whenever I hear that a favorite book is being made into a film, I am simultaneously excited for the film, and worried that it won't do the book justice, or worse, will ruin my vision of it. I'm more worried than usual for this one, because according to the article, Kaufman is known for taking adaptations into "all kinds of imaginative directions not found in the pages of those books." Now, I'm not a person that believes that movies need to adhere exactly to the book. Rather the opposite: sometimes when a film tries to stick too closely to the book, it ends up stilted. Books and movies are two different media, requiring different storytelling techniques. For example, I was pretty happy with the Hunger Games movie and felt that most of the changes made it a stronger film. However, when I hear that a screenwriter may take a favorite book in imaginative directions, I have to ask "Why?" Patrick Ness' masterpiece is already imaginative enough. I can't imagine that Kaufman, or anyone else, could improve on it. On the other hand, Apocalypse Now and Blade Runner are two excellent films that are hugely different from their literary sources. (I studied both of those in a "Books to Film" literature class I took in college). So even a drastically changed story can be good. But when the story is a favorite, as this one is for me, it can be hard to swallow. Right now, it's hard to say what will happen. Perhaps Kaufman won't make imaginative changes. Or perhaps he will, and they will make a better film. For now, I'll wait and keep an open mind, although I can't help a feeling of dread as well. In the mean time, if you haven't read this excellent series, I suggest you read it. "Charlie Kaufman To Adapt ‘Chaos Walking,’ Lionsgate’s Next Franchise Play"
Disclosure: The links above are affiliate links, and I earn a very small percentage of any sales made through the links. Kaufman is one of my favorite screenwriters but he does get really crazy with his book adaptations. Consider the film "Adaptation" which is supposedly an adaption of the non-fiction book The Orchid Thief by Susan Orlean but is really a movie about writing an adaptation of The Orchid Thief (and it's a fantasy film at that). I think you're right to worry that Ness's story could get lost, but the film, if Kaufman's previous work is any indicator, should be fascinating in its own right.